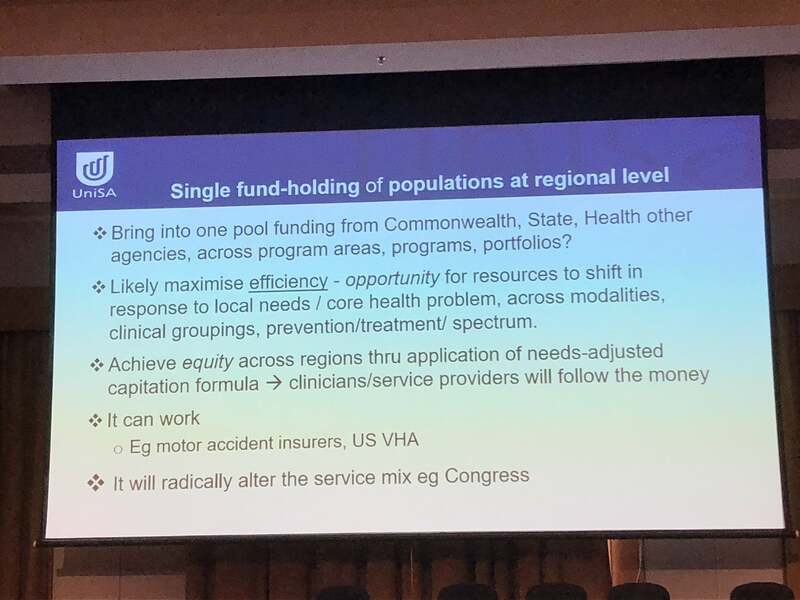 Moving to a single fundholding model has many potential benefits for the health of populations, but also comes with some significant challenges, according to Professor Leonie Segal from the University of South Australia. 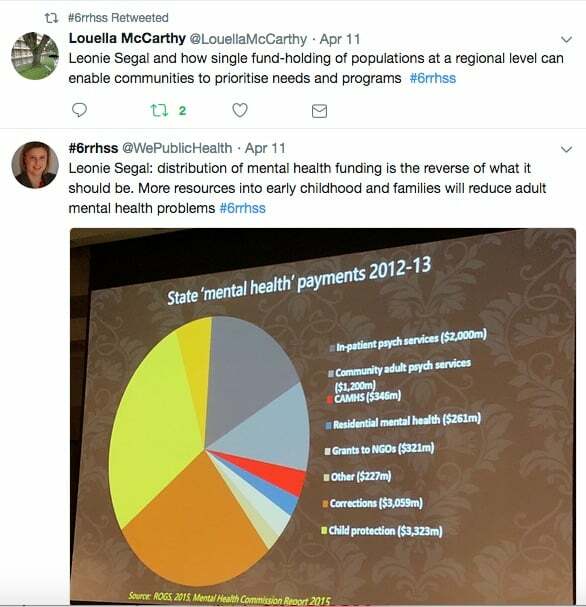 Segal also highlighted the critical importance of trauma as a public health issue and the need to redistribute mental health funding towards a greater investment in early childhood and famlies in her recent presentation to the 6th Rural and Remote Health Scientific Symposium. Jennifer Doggett reports below for the Croakey Conference News Service. Economics is often viewed suspiciously within the health sector as the vehicle used by governments and other funders to justify crude cost-cutting. However, economics can be a powerful tool for achieving greater equity in health care through demonstrating how maximum value can be obtained for the use of limited resources. This was the subject of the keynote presentation by Professor Leonie Segal at the 6th Rural and Remote Health Scientific Symposium, held recently in Canberra. Segal, who describes herself as an ‘economist of health and well-being’, started by explaining that, at its core, economics focusses on how to maximise benefit when resources are scarce. She went on to describe economists as taking a ‘systems approach’ to health care, rather than focussing on one specific component of the health system. This means that they have the ability to look across modalities and identify the best mix of services, from options such as medical care, public health policies and social programs, to achieve a specific outcome. Segal described three different forms of equity relevant to planning and evaluating health programs: horizontal equity, which delivers equal access for equal needs; vertical equity, which supports greater access to those with greater need; and regional equity which argues that regardless of location, ensure everyone has access to services they need regardless of location. Regional equity – people living in rural areas with a similar level of need receive substantially less health care than their counterparts living in cities. “Every time the Government supports private health insurance it costs the community money and diverts resources away from the public sector. She also reminded delegates that the medical profession was the biggest opponents of the introduction of Medicare, concerned about the impact of a universal funding system on their status and earning capacity. Segal explained the importance of ‘defining the question’ before undertaking economic research on a health program or issue. If she had a three-year research grant, she would typically spend six months understanding the research question. In particular, she described the type of ‘deep understanding’ of the causal pathways to ill health and disease needed to undertake successful research. She also explained the importance of taking into account the broad and long-term impact of illness and disability on the community as a whole. Often research studies assess the outcome of a specific policy or program for its primary target but fail to take into account the impact on families and communities. 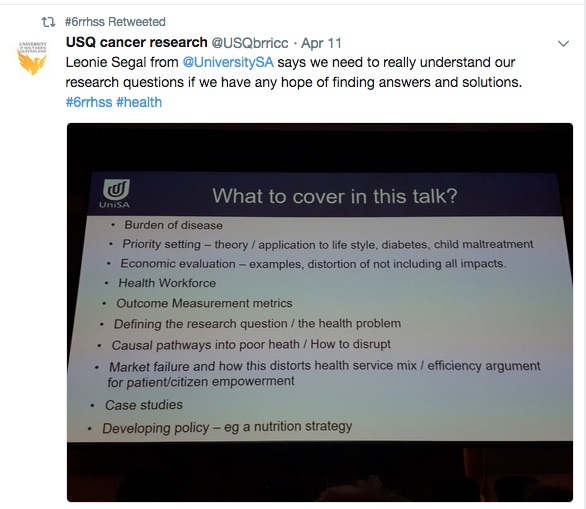 This does not make sense as health challenges can profoundly affect families and communities, and therefore should be captured in research and evaluations. Segal outlined the advantages and disadvantages of a single fundholding model – a model which involving pooling Commonwealth, State/Territory and other funding from other sources across program areas and portfolios. Typically these models operate at regional level with a local governance body overseeing the allocating of funding to meet locally defined priorities. Segal explained that, in theory, these models should maximise outcomes as they offer the opportunity to shift resources where they deliver most value. They also include a strong focus on obtaining community input into setting priorities, which often place a higher priority on equity than our current system. The potential for this system to influence service mix is evident from the Central Australia Aboriginal Congress, a primary health care service supported by a single pooled fund and run by a community-controlled board, which delivers care for around 9,000 Indigenous people in Alice Spring and surrounding areas. The programs run by Congress include a strong focus on social and emotional well-being targeting specific groups such as youth, men women and babies and early childhood. Other priorities are public health advocacy and mental health. Segal also outlined the challenges with a single fund model, which include dealing with vested interests, particularly given the radical change in clinical service mix that typically result from the implementation of this model. Another challenge is to persuade Governments to give up the profile-building and media opportunities that come from announcing national programs targeting a specific disease or population group. Other challenges included allowing regions to set different priorities, dealing with non-health issues that impact upon health and managing financial risks, specifically in a fee-for-service environment. Skilling up the community to participate in priority setting processes is also vital to ensure genuine input that reflects community needs. Professor Segal outlined her work on closing the health gap between marginalised/disadvantaged groups and the mainstream. In implementing her approach of first obtaining a ‘deep understanding’ of the problem, she identified issues of trauma, including inherited trauma, as key influencing factors. Segal cited research demonstrating that trauma is toxic to brain development and can affect all trajectories of the developing child. She also described how trauma resulting from factors such as dispossession and racism can be passed through generations leading to a cycle of poor parenting, abuse and neglect, resulting in mental and physical illnesses which in turn make parenting difficult etc. Focusing on children and the early childhood family environment as a priority can help break out of this cycle. 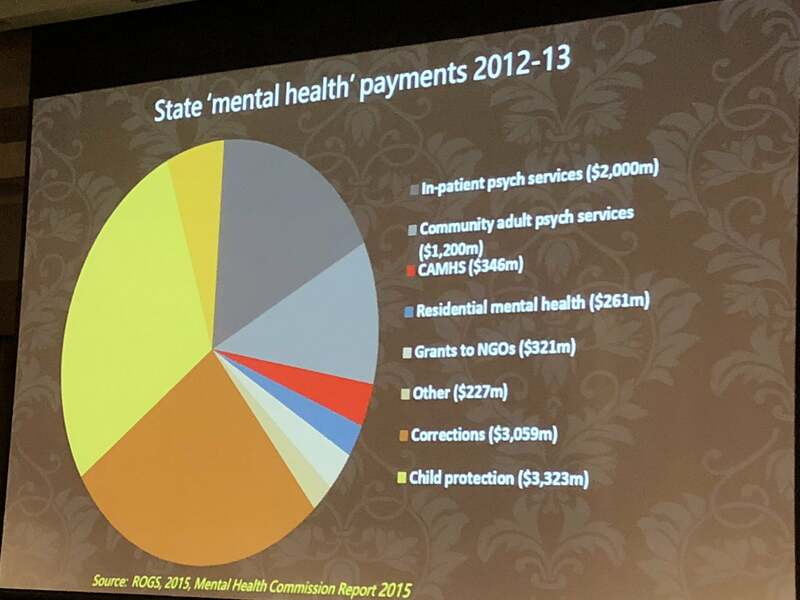 However, Segal showed a number of slides that showed that the bulk of funding for mental health goes to treating problems that have already developed rather than on preventing their development in the first place. Segal also provided an example of how understanding the causes of Type 2 diabetes can inform changes in the primary care service team away from a heavy emphasis on GP services towards more involvement from social workers, psychologists and dietitians. In conclusion, Segal summarised the important role of economics in promoting a more equitable and efficient health system and stated that her overall aim in her work was to provide policy-driven evidence in order to create evidence-driven policy. • Jennifer Doggett is covering the Symposium for the Croakey Conference News Service. Follow the discussion at @WePublicHealth, @NRHAlliance and #6rrhss. Track our coverage at this link.